I'm sorry I haven't been around lately - my Mum visited me for three days and we were so busy shopping and eating I barely had time to do anything. She arrived this Wednesday, and you already saw the lovely food we ate. On Thursday we spent the day in the city, and you shall see those eats on the next WIAW. Friday we spent the day making her homemade pies - the recipe will be up soon. Then we had lunch at the Bavarian Bier Cafe - we both had warm pretzels, schnitzel and apple strudel. It was an amazing three days and I miss her horribly already. But in other good news, my Dad and grandparents are arriving next weekend. The Brisbane Roar are in the grand final of the soccer, so my grandparents are flying down and bringing my Dad with them. How sweet of them is that? So I intend to have another lovely weekend full of great food. In other good news, I am back to eating healthily and exercising after an extended break over Easter. It feels great to be working again. My friend came over to have dinner with me last night and he said I looked like I was healthy, so that was great news. Now, these chocolate balls. 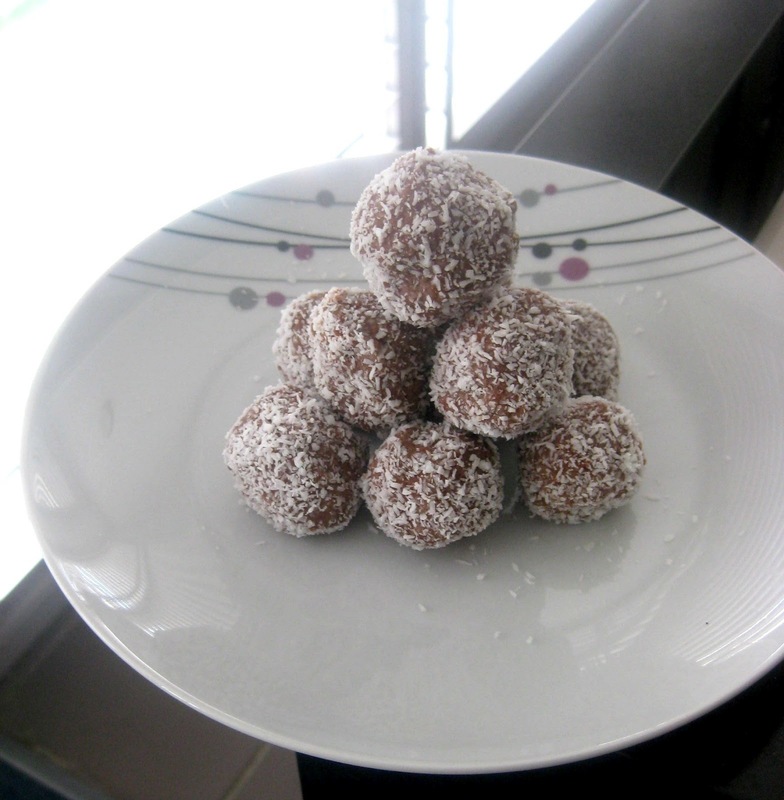 They are kind of like rum balls, but without the rum. So you could add rum to them if you wish, but not being a rum drinker, I have no idea how much you should add. My grandmother made these at Christmas, as like a snack for us prior to lunch. I don't know how much lunch I ate because I had so many of these before hand. I would never make these as a snack to keep in my house. I would make these for a party, to bring when you are told 'not to bring a thing'. They are easy to make, and, being small and already in portion sizes, are a perfect party treat. I would make them to have at Christmas or Easter parties, or even for children's parties for something different. Also, they would make a great housewarming gift for neighbours. I might make them if we went on a picnic (a large group of us), but it is not something I would make just to have in the house. As fantastic as they are, no one needs that temptation. I know lately all my recipes have been chocolate ones. I swear this is not what I eat on a daily basis. I'd be lucky to eat one or two of these. They were demolished by roomates and visiting friends. I do not eat the sweet stuff on my blog most of the time - maybe a little of it, but often it is made for the purpose of giving to roomates or friends as gifts. As you can see, I do love my chocolate and coconut. They go so well together. Trust me, this recipe is perfect for party snacks. It's also so easy I feel bad claiming it is a recipe. Level of Difficulty: Ridiculously easy. So easy I feel bad posting the recipe on here. Menu Options: Perfect as a present for someone, or as a snack to bring to a party – perfect for when you’re told ‘not to bring a thing’. I couldn’t actually check the nutritional value as the recipe calculator I use didn’t recognise the biscuits. Using various other biscuits the value was between 70 and 100 calories for an individual chocolate ball. Makes approximately 30 small balls. - 1 packet / 200g of Chocolate Creamies by White Wings. These are an Australian biscuit. They are pretty much two chocolate biscuits sandwiched together with whipped chocolate cream in the middle. You can use other chocolate biscuits with regular cream in the middle, but I would add more cocoa. Crush the biscuits in a food processor until the mixture resembles fine breadcrumbs. Place them in a large bowl with the coconut, cocoa and condensed milk and mix well. Cover the bowl with plastic wrap and refrigerate for 3 - 4 hours. When the mixture is suitably hard, spoon the mixture into balls. I used my hands to roll them into balls. This step is optional: coat the balls in coconut after they are shaped. Place in a container and refrigerate overnight. Serve slightly chilled, although it doesn’t really matter if they are served at room temperature. I just noticed that you're from Brisbane?! I just moved to Brisbane! :D This is definitely going on my blog roll.. i never find australian blogs, let alone ones in the same city as me! Hey! I'm definitely making these with some peanut butter in them. Have you tried any other flavor combos? I've been seeing similar post to these alot lately. I think someones trying to tell me i've been putting off this recipe for too long. It is a brilliant recipe. I have actually tried it with crunchy peanut butter - I just added a couple of tablespoons (not sure how many) and mixed it in right before making the balls. It was great! :) Thanks for the comment!